In our house, Friday night is pizza night. It’s not set in stone, sometimes we get a pizza craving on a different night, sometimes we’re not in the mood. But the nice thing about planning on pizza once a week, is that we come up with all sorts of fantastic combinations depending on what’s in our fridge. Last week’s pizza was such a winner, we’re making it again this week! This recipe packs a healthy green punch with lots of spinach and broccoli, but don’t worry, it doesn’t taste healthy! Have you ever had prosciutto pizza? If you’ve been reading long you know that I love prosciutto, I make prosciutto asparagus, prosciutto and feta rolls, put prosciutto in pasta and toss it in salads. I had a couple pieces of prosciutto left from a cooking class and decided to try it on pizza. Ooh la la! The prosciutto gives a slightly salty and nutty flavor to the pizza that takes it from plain old pizza to GOURMET pizza. I’ve been a fan of broccoli on pizza for some time now, but what caught me by surprise was how much children seem to love broccoli pizza! Every time I do a kids cooking class with pizza, at least half of the children seriously pile on the broccoli. Their parents look on in wonder and when I compliment the kids on their choices, the adults quickly chime in “Yes that’s so great! We’ll start making pizza at home!” Apparently broccoli just tastes better on pizza. For making your own pizza, I highly recommend a pizza stone. By preheating a pizza stone in your oven and then baking the pizza on it, you get a nice crispy crust cooked all the way through, and can cook your pizza in a much shorter time. If you’re going to get a pizza stone, and make pizza at least once a month, you should look at getting a more expensive stone that’s gotten good reviews. The one I linked to above is anywhere from $30-45, but for us it’s worth it. Cheaper stones often crack, especially at the high temperatures pizza is supposed to be cooked in. I like to pre-bake my crust for a few minutes because I prefer thin crusts. By letting the top get a little bit crispy before adding my toppings, I can ensure the crust is sturdy enough to be held for eating. I hate droopy pizza! For the recipe below, I’m focusing on the toppings. 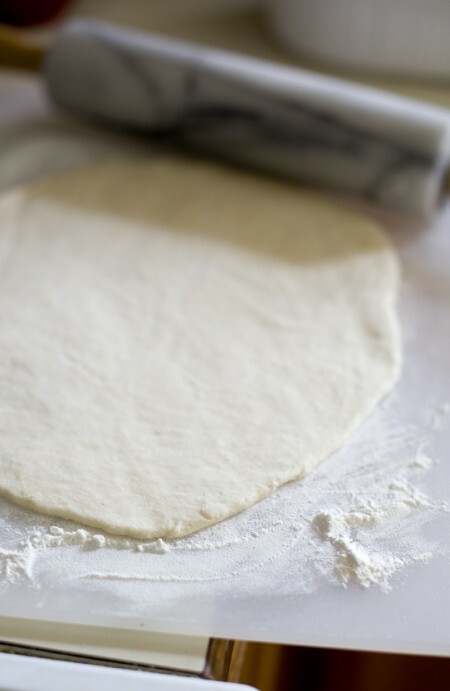 If you don’t have a favorite pizza crust, you can try my no rise pizza dough. 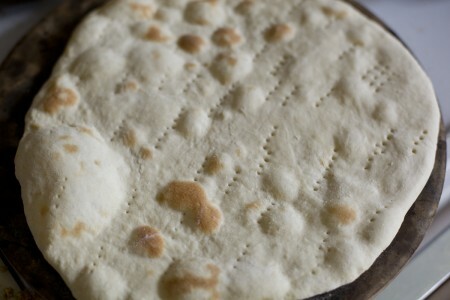 That dough recipe also gives instructions for using a baking sheet or metal pizza pan if you don’t have a pizza stone. For the tomato sauce, I just open up a can of plain tomato sauce and pour it into a plastic container. Then I mix in minced garlic, Italian seasoning, onion powder, sugar and salt to taste. I spread sauce very thinly on my pizzas (helps fight droopy pizza syndrome) and keep the rest in the fridge. It will last me for three pizzas and a batch of impromptu pasta or something over two-three weeks. If you’ve already got a jar of pre-seasoned tomato sauce, feel free to use that. Marinara sauce is really good. Sometimes I’ll get some from the discontinued item shelf when it’s just $1 a jar and use that for pizza. Okay last tip, when baking your pizza, if you think your crust is done but the cheese isn’t quite melted enough, crank the oven up from 500 to broil. You need to stand there watching it, but it will help your cheese bubble and brown quickly. When you pull it out, feel free to top your pizza off with fresh herbs. Oregano is really good on this one, I also love thyme and basil on pizza. Preheat oven to 500 degrees. Use a spoon to spread tomato sauce all around the top of the pizza crust. Scatter pieces of prosciutto across the pizza and sprinkle crumbled feta over the top. 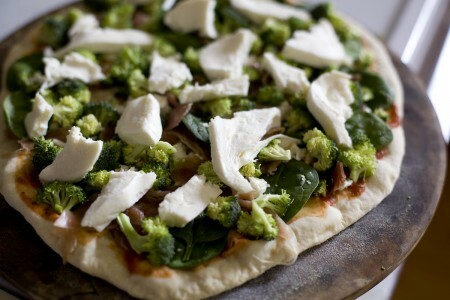 Place spinach leaves in a single layer on the pizza and scatter broccoli florets over them. Top with chunks of fresh mozzarella. Bake 5-7 minutes, until cheese is bubbling and turning golden brown in places. Let sit 5 minutes before cutting. Approximate cost/serving: Making the crust yourself is much cheaper than buying a premade one. I find prosciutto cheapest at Sam’s Club and feta as well, always get a block of feta and crumble it yourself to save some money. The oregano I grow myself. This cost me around $3 for the whole pizza. Eric and I each eat 2 big slices (no sides or salad) so $1.50/serving. Vegetarian/Gluten Free: You can leave off the prosciutto to make it vegetarian if you still eat cheese. My friend Shauna has a great gluten free pizza crust recipe. I have just a super cheap stone (I feel like it was $10-$15 at an outlet mall) and I have to say it’s worked suprisingly well. It looks terrible but works just fine. I adore proscuitto on pizza. It adds such a delicious salty and meaty flavor and a little goes a long way. That’s awesome, mine was probably a cheaper one as well, got it as a wedding gift. All the cheap ones I’ve looked at on Amazon have really bad reviews for breaking. Think an outlet mall might be the way to go! how it turns out!how it turns out! Oooh, this pizza looks amazing! 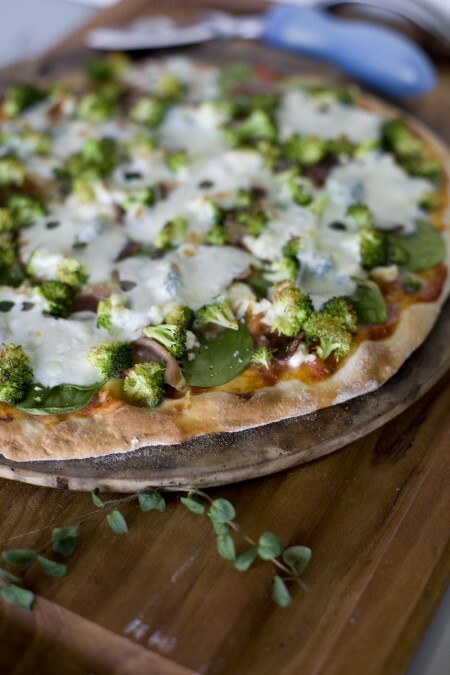 I love using green veggies like broccoli on pizza, and the prosciutto sounds super yummy too. Thanks Sara, I think I’ve made three more pizzas with spinach and broccoli since that post. It’s SO good! I really love pizza. And I’ve been trying to lose weight and eat a bit better. I think this could totally satisfy my cravings! Good for you Kim. I love pizza too. We never buy it because homemade is so much better, and you can load it up with veggies and feel really good about what’s going into your body. 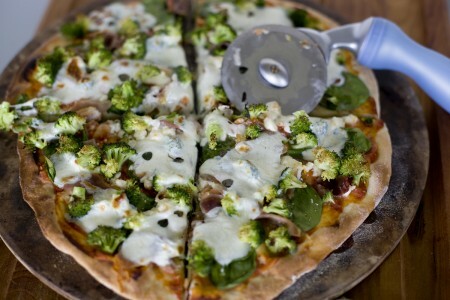 Pizza makes me weak in the knees; this one looks fresh and savory, a wonderful combination. whats your pizza base recipe? looks yummy! Hi Cat, I’m working on perfecting that and hope to have it posted this month. I make it with fresh ground whole wheat!